The Environmental Section participates in several committees of the Lake Superior Binational Program. These committees include the Habitat, Terrestrial and Aquatic Wildlife, Mining Sustainability, and Chemical Committees of the Superior Work Group. Past projects in Lake Superior include mapping of spawning and nursery areas in cooperation with GLIFWC's Great Lakes Section (http://www.lic.wisc.edu/glifwc/lake_superior.html/) and development of chemical contaminant databases for Lake Superior fish. Environmental staff are involved in the Lake Superior Binational Program and the Lakewide Management Plan (LaMP). The LaMP is an iterative document that sets goal strategies and projects designed to further the restoration and protection of the Lake Superior basin ecosystem. Staff continued the development and maintenance of a database of mining activity throughout the Lake Superior watershed. This database incorporates information from the ceded territories as well as from Canada to provide a basin-wide perspective. 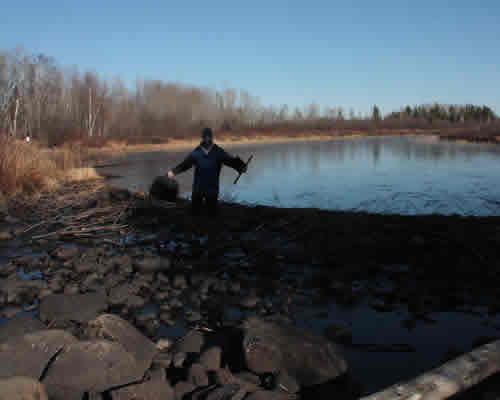 Staff also began inplementing a tributary monitoring project as a part of the Year of Intensive Monitoring in Lake Superior. The Year of Intensive Monitoring-Mining (YIMM) project is a coordinated effort among federal, state, federal, and tribal resource agencies and NGOs to monitor sediments, biota, and water quality in watersheds that are relatively undisturbed but may experience mining exploration and activity. As a part of the YIMM project, three stream gauges have been installed and sediment and water samples collected at 16 sites in three states.